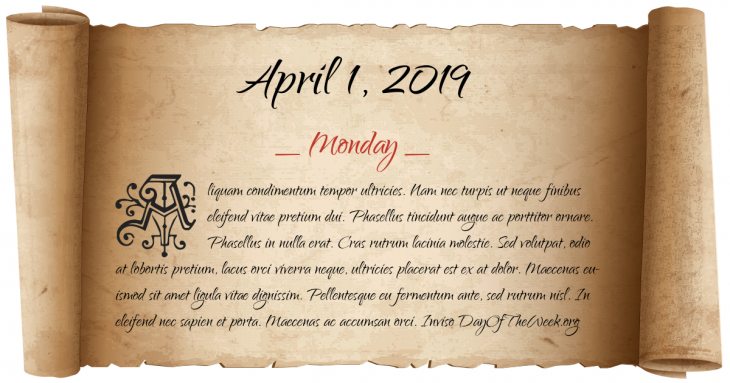 What Day Of The Week Was April 1? April 1 is most notable in many countries for being April Fools’ Day. In the Eighty Years’ War, the Watergeuzen capture Brielle from the Spaniards, gaining the first foothold on land for what would become the Dutch Republic. In New York City, the United States House of Representatives holds its first quorum and elects Frederick Muhlenberg of Pennsylvania as its first House Speaker. World War II: Operation Iceberg – United States troops land on Okinawa in the last campaign of the war. Cold War: Berlin Airlift– Military forces, under direction of the Russian-controlled government in East Germany, set-up a land blockade of West Berlin. The TIROS-1 satellite transmits the first television picture from space. President Richard Nixon signs the Public Health Cigarette Smoking Act into law, requiring the Surgeon General’s warnings on tobacco products and banning cigarette advertisements on television and radio in the United States, starting on January 1, 1971. Project Tiger, a tiger conservation project, is launched in the Corbett National Park, India. Who were born on April 1?